The Upside-down house or Rumah Terbalik is one of Sabah’s newest attractions. This 1500 sq. foot topsy-turvy abode is hard to miss, as it stands out prominently in Kampung Bantayan-Telibong in Tamparuli, a location situated along the main highway that leads to Sabah’s famous attractions like the towering Mt Kinabalu, Poring Hot Spring and Kiulu River. The builder of the upside-down house, construction firm owner and tourist lodge operator; Alexander Yee, specifically chose this location for the dwelling, in order to draw attention to its unusual structure. Moreover, aside from entertaining the crowds, Yee wants to use his upside-down home to drive home his message of nature conservation, for he says if we continue to exploit our natural resources at the rate at which we are doing now, there will come a time when nature will revolt to turn our world upside-down and that would be catastrophic. Yee goes on to add that through the construction of this topsy-turvy house, he wanted to change how people approached life and themselves. Yee’s upside-down house took six months to build and is constructed out of recycled wooed and materials. The house which is the only one of its kind in Malaysia displays various decorative features native to Sabah and is fully furnished and equipped with a living room, a dining room, an outfitted kitchen, a veranda, two bedrooms and a toilet. Outside the house stands a garage, where a car has been parked upside-down to stay in line with the theme. The house which has been flipped on its head provides a totally different perspective, as for its ceiling is actually its floor and its fitted furniture and appliances appear to be suspended over your head. In February 2012, Rumah Terbalik has been entered in the Malaysia Book of Records as the first upside-down house of Malaysia. 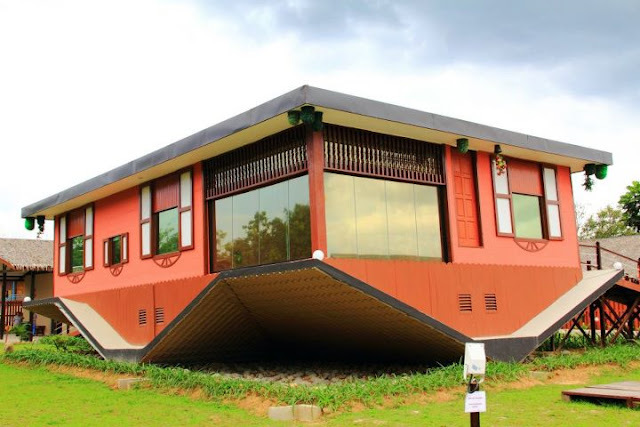 A visit to the first Upside-down house in Malaysia is bound to provide a memorable experience and should be included as a must-do on any visit Sabah itinerary. Also onsite at the attraction is well-stocked souvenir shop that offers handicrafts and souvenirs made in Sabah and a café offering locally brewed coffee along with much delicious native fare.